Hello! 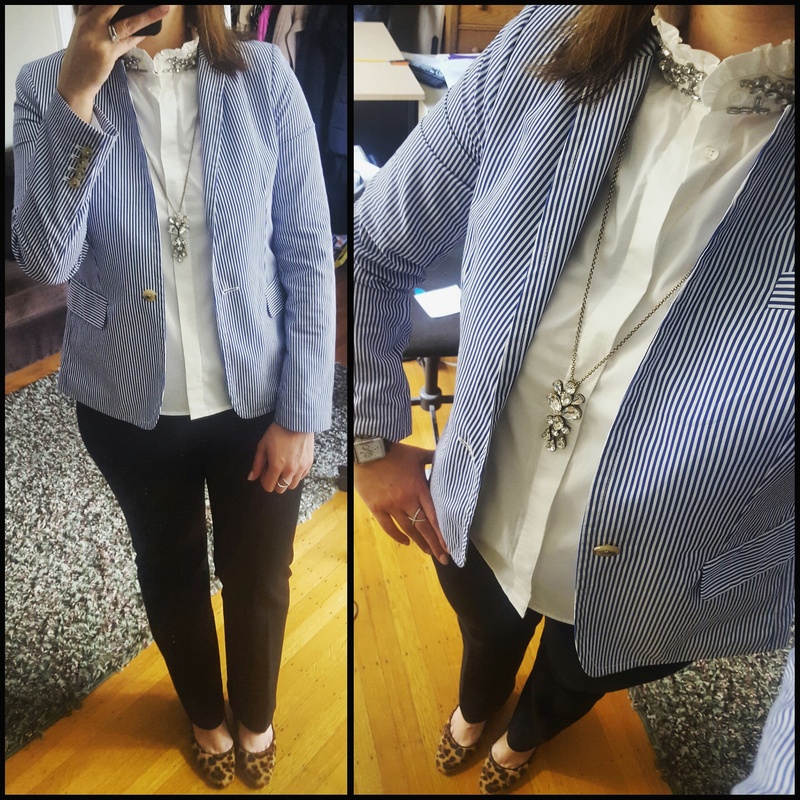 While Labor Day is come and gone (and I’m still wearing white jeans…and probably a white blazer for a little while longer!) the weather here has been warm so I am very much in season transition mode. No sweaters here (yet)! And navy continues to be my go to neutral as we venture in to September. I really want to get back in to sharing outfits for those of you who aren’t on Instagram so for those of you who follow me on Instagram, these are a bit of a repeat, but here are some of my favorites from the end of summer/early fall. This first outfit is something you could wear in to September. I knew these J.Crew Factory Suede D’Orsay Tassel flats had to be mine as soon as I saw them at the store! 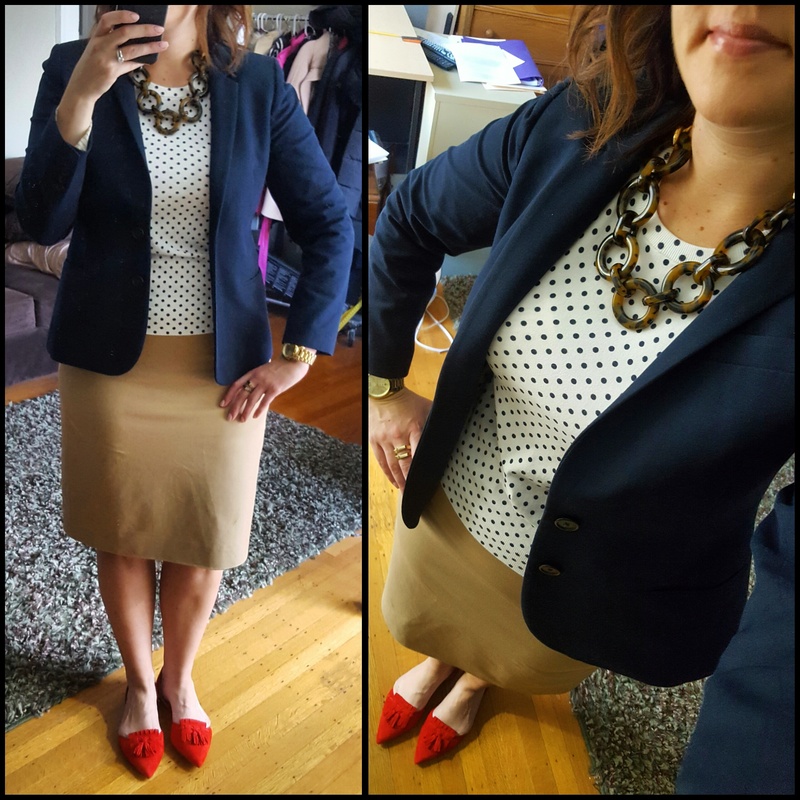 I started out with the shoes, and was thinking about the camel Regent blazer that is on it’s way to me, and remembered I had this skirt. I tried the shell first minus the blazer but it wasn’t quite right so I added the navy cotton blazer to break up the lighter colors and the necklace was the finishing touch. Definitely a preppy vibe but this outfit was an example of putting neutrals together in a way that was a new combination for me. And all of these are items you can currently find at J.Crew or are classic enough that you may have other alternatives in your closet. I’ll be keeping this color story in mind heading in to fall with wool pants or a double serge wool pencil skirt – or navy pants/skirt and a camel blazer. These shoes will be on repeat through the fall and winter I’m sure! 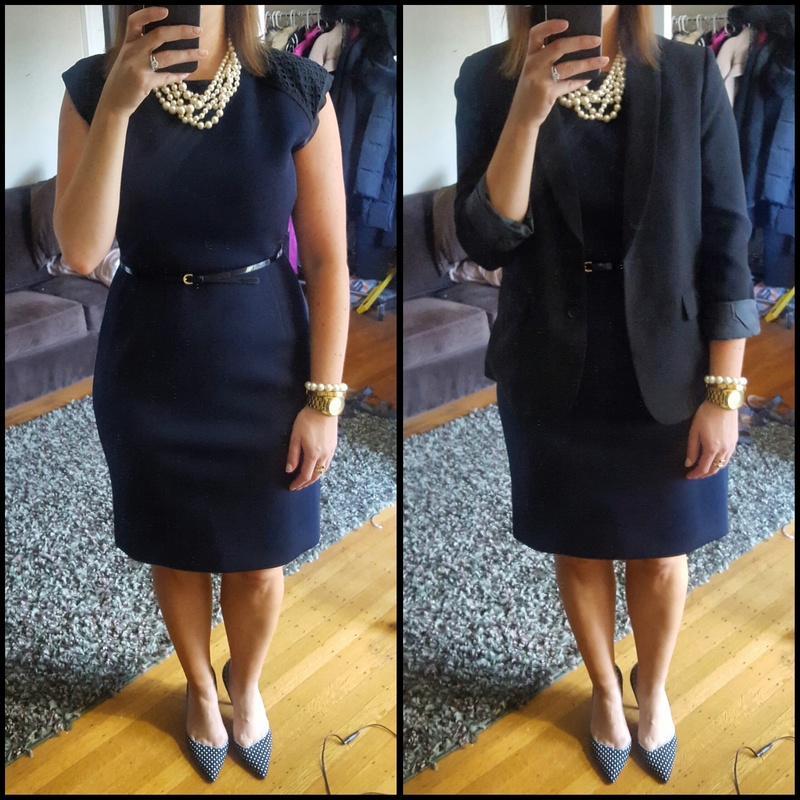 These items are all true to size, I take my usual size 12 in the skirt/blazer, a large in the shell and a 9.5 in the flats (they JUST fit – they’re definitely a tad snug out of the gate). Next up, a classic black/white combination. And STRIPES of course. This ruffle-sleeve top found it’s way to me several weeks ago but I just finally pulled it out to wear it last week and now that I’ve gone and gotten properly fitted for a bra (more about that in another post), this top fit me even better and I’m looking forward to wearing it more this fall. The pants are the cotton version of the Banana Republic Avery crop pants which are my new love at Banana Republic. These run true to size and are great for those of us who are curvy on bottom! Next up are two semi-summery look but the blazers can be swapped out for a more season appropriate one come fall. 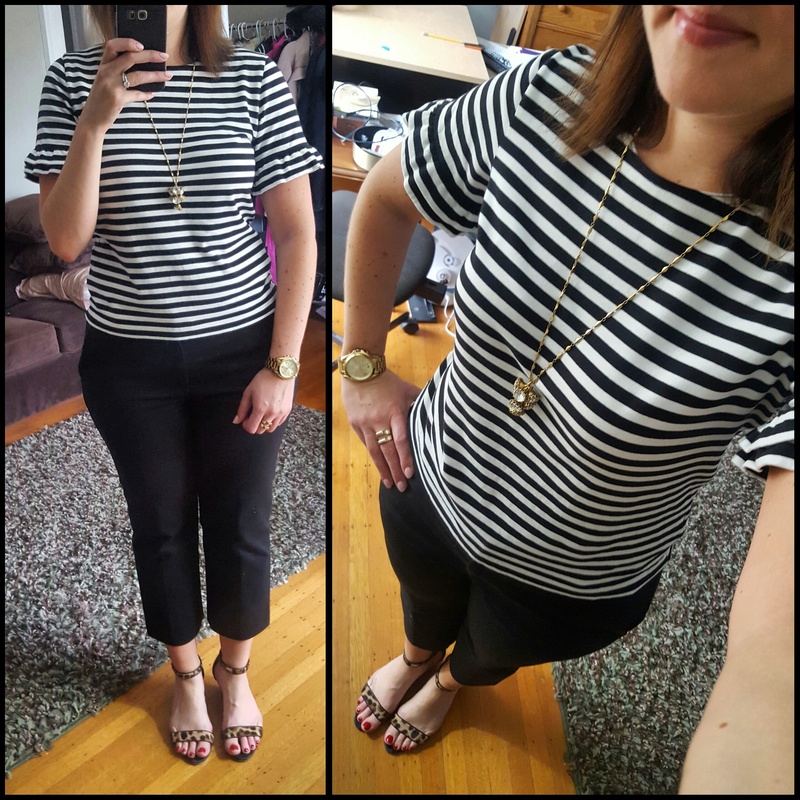 Shirting stripes and leopard are one of my favorite combinations and one I keep coming back to over and over again. Lastly, speaking of navy, I have been all about the black and navy pairing. Black and navy and black and brown always used to be such a faux pas, but now it seems to be everywhere and I can’t get enough. I’m not really much of a brown wearer but I am all about the navy and black. 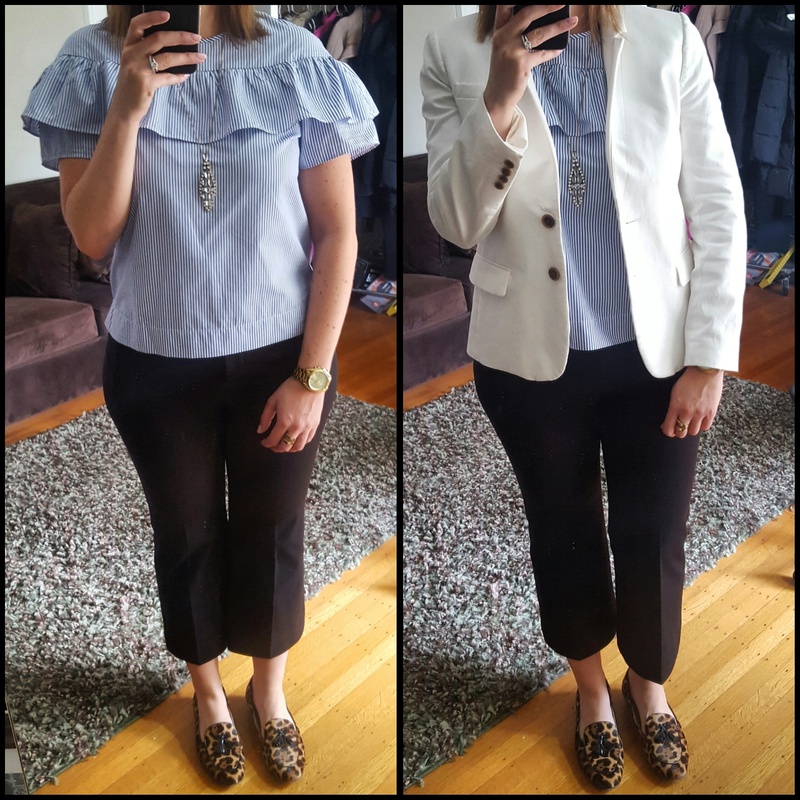 I’ve also had this J.Crew factory boyfriend blazer in my closet for months and thought it was a tad too big – I decided to roll the sleeves on it and I find that it balances out the relaxed nature of the blazer. This dress is a shift dress from last summer at J.Crew and the pearls of course are on regular rotation. Well, I spoke too soon, because it took me a few days to write this post and this morning the weather seems to have turned (cue my seasonal cold!) I’m excited to check out the new fall arrivals at J.Crew and Banana Republic and start to switch out my fall clothes! I feel a bit of a closet purge coming on as well so we’ll see how that goes. For now, thanks for stopping by and would love to hear how you’re getting ready for fall!